O Jesus, fairest of the children of men, Thou whom I see crushed beneath the weight of my sins, covered with wounds, Thy hands and feet pierced with nails, Thy side opened with a lance, I adore Thee and recognize Thee as my Lord and my God and as my beloved Redeemer. Pierced with grief at sight of the Blood flowing from Thy wounds for the redemption of souls, I feel irresistibly urged to consecrate myself to the worship of this regenerating Blood and, by an exemplary life, to atone for all the profanations of this Divine Blood and for those which It still receives daily in the veins of Thy Sacred Body present mystically on the altar. 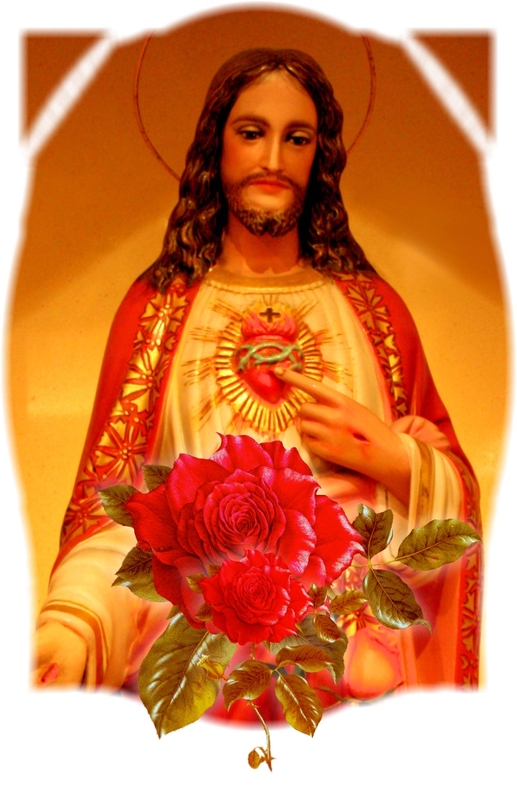 By this consecration which I beg Thee to accept, O my Savior, I desire to spend my whole life in proving to Thee my gratitude and my love by paying frequent homage to Thy Precious Blood and by propagating this devotion as far as is in my power. I desire every pulsation of my heart to be a renewal of this consecration, a constantly repeated act of love for this redeeming Blood, a perpetual offering of Its merits in behalf of sinners and all the souls dear to me, and a hymn of unceasing praise in union with that of the Saints and all the blessed in Heaven: "To the Lamb who redeemed us in His Blood, be honor and glory and benediction forever." O Mary, Mother of the Divine Redeemer, obtain for me the grace of adoring fervently throughout my life the Blood of thy Divine Son and of singing forever Its mercies in Heaven. Amen. Blood of my Savior, a thousand times adorable! Blood a thousand times Precious! Thou, Which dost adorn the Baptismal innocence of children, deign to bless this young soul whom we consecrate to Thee this day. O sweet Jesus! hide beneath the vivifying waves of Thy Most Precious Blood thy little [name] so that he [she] may grow in grace and holiness all the days of his [her] life. Deign to look upon him [her] as a perpetual adorer of Thy Divine Blood in as far as the designs of Providence will permit and grant that all his [her] prayers, deeds and sacrifices may be so many acts of reparation and love. O Immaculate Virgin, ever spotless through the Blood of Jesus, thou who art called the "Flower of the Field" and the "Lily of the Valley," look down lovingly from thy Heavenly throne upon this dear child; may he [she] grow up also under thy maternal care, shielded by thy blessings, and may every day of his [her] life be marked by thy benefits. Most Holy Virgin whom the Church calls "Morning Star," shine upon this soul now commencing his [her] earthly pilgrimage, preserve him [her] from all harm, and until the last moment of his [her] life, may he [she] keep pure and unsullied the robe with which, through the Blood of Jesus, he [she] was robed in holy Baptism. Take his [her] family also under thy protection, O Mary. Bless his [her] pious parents, remove far from them every temporal or spiritual misfortune, and may peace, charity and all virtues dear to thy pure and holy heart dwell ever in their midst. Amen.